National Diabetes Month is upon us. I was recently asked about what I thought people without diabetes, or unfamiliar with diabetes, should be made more aware of. People are oblivious. People are ignorant. People think they know everything. I say “people” because I have to include myself in that category. Before being diagnosed with type 1 diabetes, I had heard of diabetes, but never knew what it actually was. I didn’t know how it could affect me. I didn’t know how it could change me. Below are a few common misconceptions about diabetes. Type 1 Diabetes does not occur from eating to much sugar. Type 1 Diabetes occurs because the immune system attacks the insulin producing beta cells in the pancreas. This has to be the first one on my list because even my husband thinks to much sugar causes diabetes! In the movie Hazel & Gretle: Witch Hunters, Hanzel had to give himself a shot because the witch made him eat to much candy as a kid. This is the type of complete obviousness that I cannot stand! No Hanzel, you did not get diabetes from eating to much candy! I don’t care what Hollywood says. Insulin is a cure for diabetes. Ask any diabetic, or parent of a diabetic, and they will agree that insulin is not a cure. It just keeps us alive until we can find an actual cure. Insulin allows me to manage diabetes a hell-of-a-lot easier, but also makes me have low blood sugars. Honestly, the low blood sugars are scarier than the high blood sugar levels. You don’t look sick. I do not “look sick” because I take serious care of my diabetes. My body is constantly having a raging war against itself. 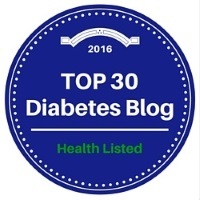 I am continuously thinking about my diabetes, and my blood sugar levels. To make the non-diabetic understand: It feels like I have a little child to always take care of… one that is always asking me to do things and play with it. One who’s body is extremely tired, but has to stay up until his blood sugar reaches a normal level. One that says he’s hungry, but has to wait at least 20 minutes until his blood sugar comes down. You’ll grow out of “it”. Ha… I wish! Diabetes and I have a long life sentence together. I wish my pancreas would just magically start producing insulin. Unfortunately, I will be insulin dependent for the rest of my life. People with diabetes can’t eat sugar. The fact of the matter is, if a diabetic has a low blood sugar, they need sugar to bring their blood sugar back to a normal level. In reality, a type 1 diabetic can eat whatever he or she wants to, they just need to give themselves insulin accordingly. Personally, I prefer not to eat much sugar or carbs because sometimes it is hard to calculate appropriately. I also feel like giving myself more insulin makes me gain weight, but this may or may not be true. You can cure diabetes with diet & exercise and loosing weight. I blame Halle Berry for this one. Halle Berry was diagnosed with diabetes. She stated that she had type 1 and had claimed that she was able to stop giving herself insulin after changing her diet. In turn, it “cured” her diabetes. Um, what? The fact is, she was probably misdiagnosed and had type 2 diabetes all along. There is no cure for type 1 diabetes… and I’ll say it again, diabetes and I have a long life sentence together. Adults can’t be diagnosed with Type 1 Diabetes. It is more rare for an adult to get type 1, but it certainly can happen. I was diagnosed at age 9. One of my good friends was diagnosed at age 17. Mary Tyler Moore was also diagnosed as an adult. It can happen at any age, it just depends on when your body decides to attack itself. You don’t need insulin if your eating sugar free cake. False. About 3 months ago, I got married. My husband and I had the top layer of our cake made sugar free, just so we knew that I could eat it on the big day. If I ate the sugar free part of the cake, would of needed insulin. Just because it’s sugar free, doesn’t mean it doesn’t have carbs. I need insulin for carbs. Fortunately for me, I was fighting a low throughout the day. Living with diabetes is a contestant balancing act. I am always giving myself insulin to counteract what I ate, the frustration I just dealt with or the unpredictable high blood sugars that just happened to come upon me. For those who don’t have diabetes, I hope you would become more aware of what we are constantly dealing with. You comments will annoy us, and cause our blood sugars to go up; If nothing else, please be aware of that! I honestly understand your frustration. I just started my own blog about having type one diabetes in college and talked about many of these misconceptions as well. Nothing makes me angrier than people thinking they can tell me what I can or cannot eat. Don’t get me wrong, I don’t mind people trying to help me or even answering their questions about diabetes, I really don’t. I just wish that diabetes awareness was a bigger deal and that more people understood it better. I strongly believe that if more people were better educated about the different types of diabetes, the stigma that surrounds those of us with type one diabetes would be much less significant. First of all there is nowhere near enough information on Adult type 1 diabetes as almost all of it is geared towards type 2. That being said, I was diagnosed with type 1 at the age of 22. I am now 48 and have been living with the constant battle for a long, long time. My A1c is 6.8 and I have not had any diabetic problems yet…..I control it very tightly in which you get a lot of lows. Type 1 is not only affected by carbs but stress and even the weather has a lot to do with it….yes, the weather. Extreme cold weather makes my body work harder to stay warm giving me low blood sugars and extreme heat makes the blood sugars higher than normal. Then if you live in Virginia, the up and downs of 70’s one day and mid 40’s the next day, your blood sugars can go haywire not including the stress involved with it all. I whole heartedly agree on the Common Myths listed above.